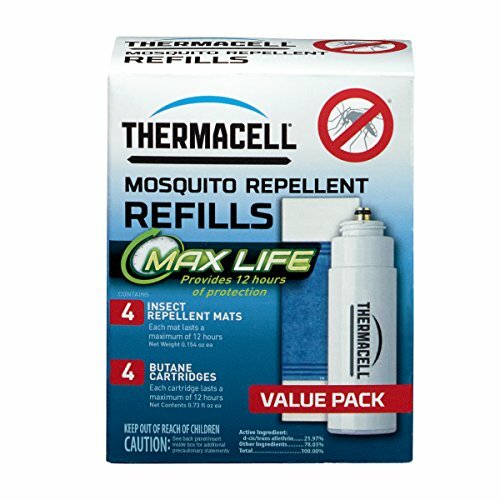 The Thermacell L-4 Max Life Mosquito Repeller Refill 48 Hour Pack effectively repels mosquitoes by creating a 15-foot zone of protection when used in a Thermacell Repeller. This refill pack containing 4 Max Life repellent mats and 4 fuel cartridges will last 48 hours total and is compatible with all Thermacell Repellers, Lanterns, and Torches. Each Max Life mat lasts 12 hours – 3X longer than original Thermacell mats – so you replace mats less frequently. Max Life repellent pads are also longer than the Original Thermacell Repeller Refills. Ideal for use while camping, fishing, gardening, hunting, around the backyard, and more. Thermacell mosquito repellent products are powered by a Thermacell fuel cartridge which directs heat to a small mat infused with the repellent Allethrin, a synthetic version of a naturally occurring repellent found in chrysanthemum flowers. Heat disperses the repellent creating the 15-foot zone of protection. Thermacell protects millions of people from mosquitoes with no messy sprays or lotions, no scent, no noise, no DEET, and no open flames. For best results, use on days with light or no wind (bugs are at their worst on these days), and allow 10-15 minutes to form a complete zone of protection around the unit. Thermacell products are safe, effective, and come with a 100% Satisfaction Guarantee. With Thermacell, Turn it on… Mosquitoes GONE! Each Max Life mat lasts 12 hours - 3X longer than original Thermacell mats - so you replace mats less frequently. Fuel cartridge also lasts 12 hours. For use in Thermacell Repellers, Lanterns, and Torches. Turn it on... Mosquitoes Gone!